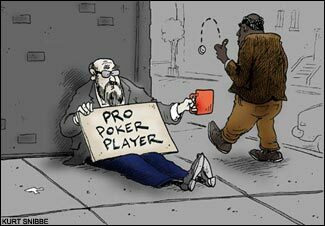 How many people actually make a living -- even a modest one -- playing poker? What percentage of "serious" players show a profit -- even a minuscule one -- for their careers? You'd think a guy (that would be moi) would ask himself those two questions before he embarked on a year-long odyssey as a "high-stakes poker pro." Well, what can I say ... sometimes, people are irrational. But, as it turns out, it wouldn't have mattered if I had asked myself those questions, because there is no reliable research on either subject -- at least, nothing since the poker explosion of a few years ago, the one started by the Card Cam (the TV camera which allows audiences to see the players' hold cards during the hand), fueled by ESPN's coverage of the World Series of Poker and the Travel Channel's broadcasts of the World Poker Tour, and topped off by the $2.5 million lamb-defeats-wolf victory of online amateur Chris Moneymaker over cunning pro Sam Farha in the 2003 WSOP. The only somewhat scholarly attempt to answer the second question that I've heard about is a piece by Nolan Dalla that appeared in Card Player magazine back in 1995, long before poker's big breakout. Dalla, a long-time writer/thinker about poker issues -- he's something of a specialist on questions of poker ethics -- teamed up with Jeff Goldberg, a math professor from Arizona State. "We calculated that about 15,000-to-20,000 players were winners in any given year, U.S. cardroom figures only," Dalla tells me. "This amounted to about 10-to-12 percent of the U.S. poker base, estimated roughly at 200,000, which we defined as the number of players who play in a public cardroom two-plus times in a calendar year." However, as Dalla points out, "these figures are grossly outdated" because this came before the expansion of gambling, the explosion of interest in poker, and, perhaps most importantly, the advent of online poker. I also asked Dalla how many people he thinks make a "decent living" from poker, which I define as $50,000-to-$100,000 per year, after deducting poker-playing expenses like the cost of traveling to and from casinos, food and lodging, dealers' tips, etc. "Well, 'decent living' means something beyond those parameters," Dalla says. "I suggest you define a 'professional,' as opposed to a semi-professional or part-timer, as anyone who makes a subsistence income or more, as long as those winnings go for living expenses. For instance, there are quite a few semi-retired players who grind out $20,000-to-$30,000 a year playing in small limit games. Also, you can't include a person with a full-time job who gets lucky and wins $200,000 in a tournament somewhere, which might account for four times his regular salary. By my definition, I would estimate the number of semi-professionals in the U.S. to be in the 30,000 range, if you define a semi-professional as a part-timer who makes some money playing poker. The number of full-time professionals, I would estimate, is a small fraction of that -- about 3,000 or so. I think 60 percent of those are online players." Greg Raymer, the winner of last year's WSOP (and a life-changing $5 million which allowed him to quit his job as a patent attorney), pretty much agrees with Dalla's educated guesses, though his evidence is mostly anecdotal and personal. "I've often heard people say that about 10 percent of poker players in any room are long-term winners," he says. "But many of those are not winning enough to support themselves. For example, I've never had a losing year; but until last year's WSOP, I also never had a year where I won anywhere near as much as my job paid, and there were only a couple of years where I won enough to call it 'a decent living'." As usual, Matt Matros, my fellow contrarian thinker and mentor/teacher (which means, like it or not, that he has to take some responsibility for my miserable performance of recent months), questions my questions themselves. "If the question is, 'What percentage of people who play poker in casinos and/or online are winners? ', then the answer is probably somewhere around 5 percent, or even lower," he says. "A lot of people will try poker once in a casino without knowing how to play, and the vast majority will go home broke. The same is true -- though to a lesser degree -- online. "But if the question is, 'What percentage of people who take the game seriously are winners? ', then that's tougher. Of course, we'd have to define what it means to take the game seriously. You could say, 'anybody who has read one poker book,' but that would exclude guys like Paul Darden, who has never read a poker book. So, leaving it as a subjective definition, I would guess 25-to-30 percent of people who take the game seriously are winners. "This brings us to the question, 'How many players actually win enough every year to earn at least $50,000 per?' I would say, very few. There are a bunch of pros playing the Vegas $30-60 games and higher, and most of them probably qualify. Ditto for the scene in L.A. Then there are the online pros -- like me, sort of. Most of them are young guys who started playing online really young and became good enough so they didn't start looking for real jobs. I would guess that, all in all, there were probably 600 people who play poker for a living and who made $50,000 or more last year. "But this is a highly unscientific guess. As you suggested, there really is no reliable 'information' on this, because this stuff obviously isn't documented anywhere." Well, this raises another question: Why not? How is it that, in an activity where every possible result is calibrated to an infinite number of decimal places, nobody can answer basic questions about how many poker players are "successful" on any level?